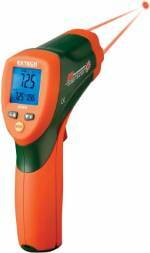 Our Fastest and most accurate IR thermometer. Dual lasers identify distance and location where accuracy is highest. 12" distance model. Fast response is ideal for quick checks of multiple spots in a process or for catching spikes in temperature. High/Low Alarms with Vision Alarm Function. Dual Color Display — Easy visual alert when temperature exceeds user programmed MAX and MIN setpoints, the display flashes from Blue to Red. Red backlit display will continue to flash until normal temperature is reached. • Complete with case and 9V battery High/Low Alarms with Vision Alarm Function. If the user-settable alarm setpoints are exceeded, the screen will flash red.